I asked some questions earlier this year about how the UREI 813 elements and their time aligned crossovers would fit in the Imperials and I got an answer from the master himself that it would fit. I have now tonight connected the first speaker of the pair to my HIFI and it is amazing... I built a pair of speakers two years ago based on a Swedish bass reflex patent that was adjusted to match the Altec Lansing 604 8K. They sound very good but now with the Imperial standing beside them they are not only midgets in size but also in sound reproduction. However there is some flaws in the design that I bought and downloaded. The braces A should be at least 130 cm to be flush to the bottom reflecting plate and you should also be careful with the gap from the compression chamber. Minor issues but anyway the sound is amazing. Through my years I have owned a variety of speakers ranging from Magneplanar Tympani and downwards but the old Altec Lansing 604 8G koaxial with the Eminence 15" bass speaker from the old UREI 813 takes the price. "you should also be careful with the gap from the compression chamber." I have now the second Imperial up and running. Unfortunately was one of the 604 8G and one of the Eminence 15" bass speaker damaged at Johannesburg intl ground handling. I managed to repair the 604 8G but not the bass speaker. Instead I bought a pair of P-Audio C15 500LF 500 Watt bass speakers. They have a FS of 39Hz, VAS 155 liters, QTS 0.29. The other Eminence is ok but they are not designed for this speaker. I have tested the speakers both with Altec Lansing 604 8K and the UREI modified 604 8G and they work perfect. Together with the new bass speakers they are amazing. I have had several friends visiting wishing that they were not married due to the size of the speakers. Here is a new picture of the pair. The will be coated with Epoxi and then sprayed with black Gel Coat. The speakers have now been updated. Due to 7dB difference to HF reproduction between the Altec Lansing 604 8G coaxial`s they unfortunately must be recharged. Present setup is 2 PA Audio C15-500LF. 2 PA Audio C15-300MB and 2 JBL 2412h compression drivers connected to 2 PA Audio PH-3220 horns. To drive the speakers I am now using a Rotel RC-06 preamp driving a dbx Driverack 260 active crossover and a Rotel RMB 1077 digital 7 channel 100 W amplifier. It sounds very good and the addition of the C15-300MB has further improved the lower frequencies. I am cutting at 204 Hz and 1500Hz with a 12 dB slope. I still miss the HF characteristics from the 604 8G and I will try to find a pair of old Altec drivers. It is now becoming somewhat costly but It is fun and the addition of the active crossover makes modifications so much easier. I am presently living in South Africa and visited Sweden last week and found a set of Altec Lansing 811B horns and 908 8B drivers. They sound much better than the JBL 2412H drivers. I have finally sent the Imperials to the paint shop and will publish a picture when they are done. I also found a pair of Mantaray MR94 horns with Altec 288 8G drivers in mint condition. They are huge and they have to wait in Sweden until I move back. It now seems that journey of building and equipping the Imperials pretty much has come to an end. My favorite speaker and the one I will likely never build or own. Your a lucky man to be able to build a set. they look pretty nice from where I am. I just got the Imperials back from the paintshop. The work is not 100% but this is Africa. However they sound very good now with the Altec 908 8B drivers connected to the 811B horns on top. Are you are still tri-amping with a C15-500LF set at 204 hz low pass 12 db/octave, A C15-300MB thru a band pass from 204 - 1500 hz 12 db/octave, and an Altec 908 driver / 811 horn set at 1500 hz high pass 12 db/octave? Yes, that`s the present configuration. All 6 speakers driven through a dbx Driverack 260. The MR94 horns will be a part of the setup when the Imperials have sailed back to Sweden. I'm impressed by these imperials and am thinking of making one myself. How does one compare to a ported design or a bass-reflex? I have been building my new house for 6 month now. It is nearly finished. I decided in april that if I have built a pair of modified Imperials, why not continue with a pair of bigger horns? 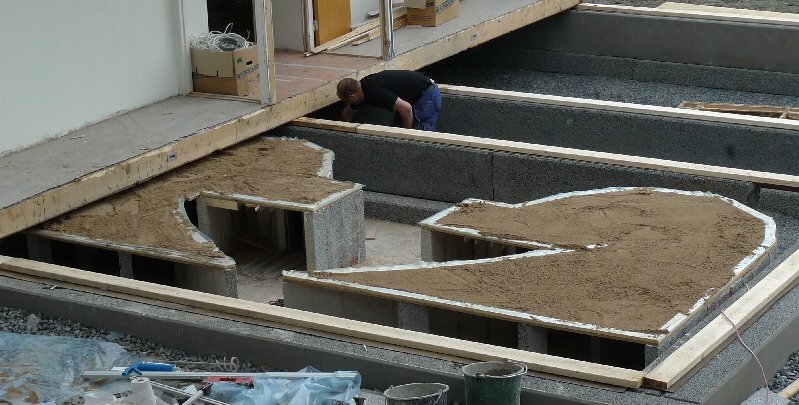 The picture shows the final stages before they were covered. There is now a 6.1 meter long and 0.6 meter horn mouth in the living room floor. 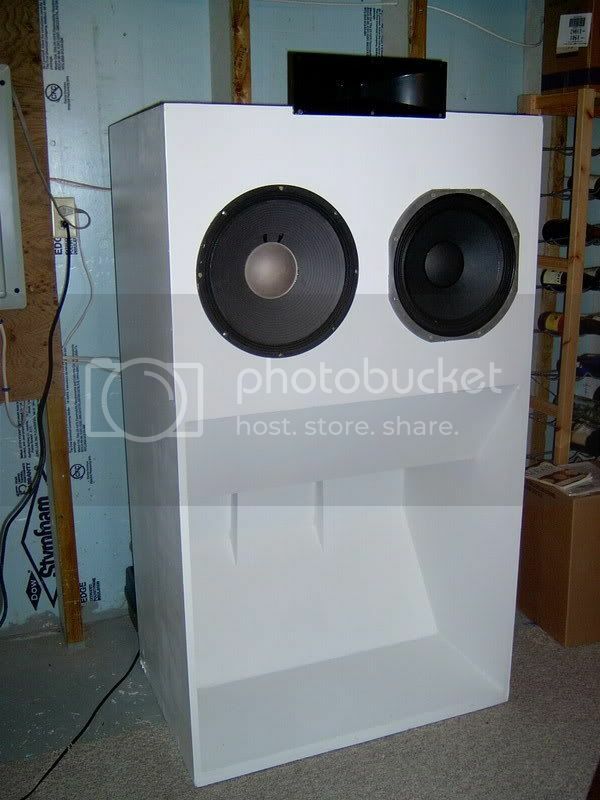 I am using 4 pcs Eighteensound 15" 15W200 woofers. They will give 124db at 20hz. I will cut them at approx 40hz. The imperials will do the rest. I will come back with a report when everything is up and running. I have been involved in modifications of a new 8 channel DSP cross over. The end result turned out to be very good. I will now start distributing them. Looking forward to read sound review. Are you still contemplating to build a pair of Decware Imperials? 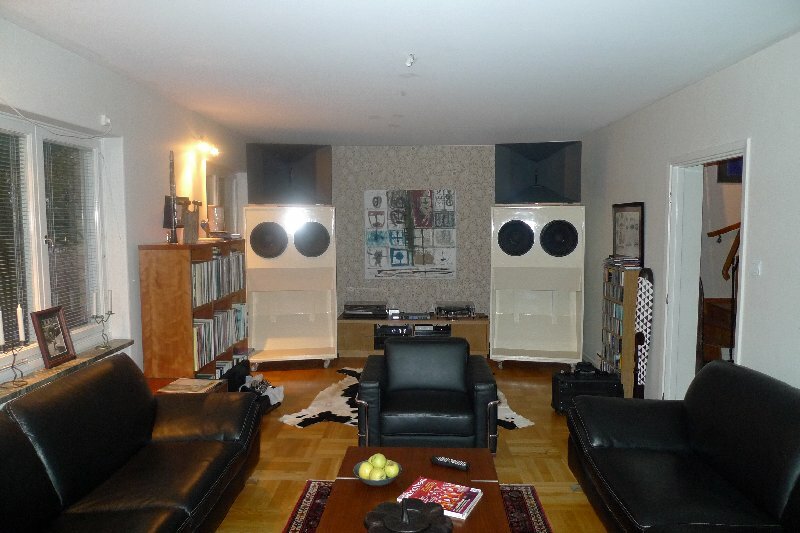 I have listened to some 30- 100.000 USD speakers since I came back to Sweden. They all look very good and they use materials as kapton and beryllium and perhaps kryptonite, but do they sound better? I say no..
Physics has not changed since Altec Lansing started to build their 604 speakers during WW2. Klangfilm was designed at the same time and still sounds extremely good. I am a firm beliver that if you in your approach to music like to be "there" 30-100 feet from the jazz group or the philarmonic orchestra, -High Sensitivety, Active Crossovers and proper horns will make your day. This Saturday I will marry a woman that understands what it takes to go under 50hz. Currently Im using a pair of Fostex bk108 and I use a corner horn with an 18" Sub from Mivoc and im quite happy with the result. 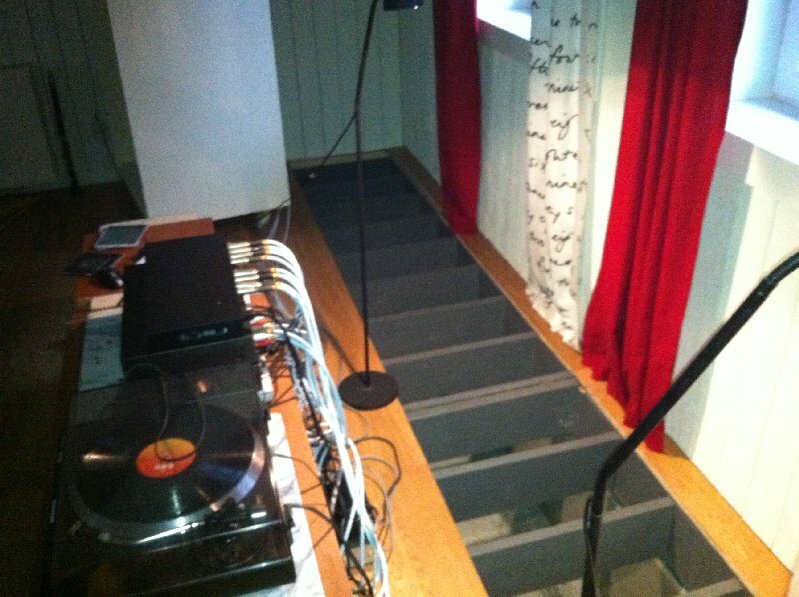 Because of lack of money, I had to cut back on speakers, my systems not worth more than 2000usd. I kinda forgot about the Imperial. Plenty people saying theres no better bass than coming from a corner horn (107db/w), and my fostex mids and highs really pull it off too. Saying that a 1000 Dollar Imperial sounds better than a 100 000 one, im not sure whether to believe, you thinking its really worth building it? Is the Imperial really something that special you get nowhere else? What Chassis would u recommend? Im a little skeptic, and decware usually exaggerates slightly when talking about their own stuff. And sorry but you cant make me believe that a 15" driver sounds better in mids than a fostex speaker with 4g membrane and qts 0.26, I guess youre only talking about the bass. Would it really be worth building it and compare with the corner horn? If you take all costs in consideration, the Decware Imperials does not come cheap. You can easily end up between 5-10.000 USD for a pair. If you look in Jensen`s technical bulletin from 1952, they are there in the original with one 15" woofer.I am using them as a 2 way system now dividing at 800hz. You can divide the Altec 288 8G compression drivers with MR94 horns as low as 500hz. The HIFI world is a very special world and defined by belief like religion. My simple belief is that if you like to reproduce a sound as close as possible to a "live" situation where you physically can feel the music, you need to go with speakers with high sensitivity and horns. If you sit on row 15 in Berwaldhallen and listen to Anton Bruckners second symphony, you feel it. I decided that if I am going to spend over 6000USD in parts and material for a pair of speakers, it would be stupid to go with passive crossovers as I would have to rebuild them for my new living room not knowing of coming reflexes and resonance frequencies. Another reason to go active was to avoid the cable jungle. As differences in capacitans and impedance allways excists between components, cables function as equalizers giving your speakers different sound reproduction. I avoid most of this by using a good quality DSP loadspeaker management system. I can not judge if your speaker elements are better or worse but I do know that if you buy proper elements for the Imperial you will be rewarded. Do you know where I can find technical detail for the imperial, including frequency analysis, and the fall of spectrum? How many db does the Imperial bring at 1w? Thats what Im really interested in. I dont really understand, to me the Imperial is just a standard, large, horn speaker, back or rear loaded whatever... I can do any calculation with any 15" driver or larger, create a large horn speaker and say it sounds great (like everyone else here) and I guess it will. Whats the big difference?? You say in order to create a live atmosphere one needs horn speakers, and lol I know I am using horn speakers with extremely high sensitivity (100db+). My Subs got 107db and Id be curious if the Imperial could top that. Here is a link to homepage where the Decware Imperial is simulated. Thanks a lot! Its in swedish, but Ill manage. 105db/w at below 20Hz is pretty impressive, wow. I might have to reconsider the damn thing... I assume they used one Imperial, with only one speaker, looks like deckert was right since he used 2 per pair, and 2 at the time ....making 122db per watt? omfg. Gonna order the plans and take a look =). I am including the Altec 288-8G with MR94 horns. I think the the design of the compression chamber is the secret. I find the bass fast and dry. I built my imperial for between $500 and $750 USD to Decware specs. It sounds great and have used it both as a sub and full range with a 1" horn on top. As a sub I was shaking an entire theater of about 750 seats. Made the glass on the back wall rattle. I'm with you gildcm, you can build an excellent set of Imperials for less tha $1000 US, if you can get hold of some resonably cheap wood. 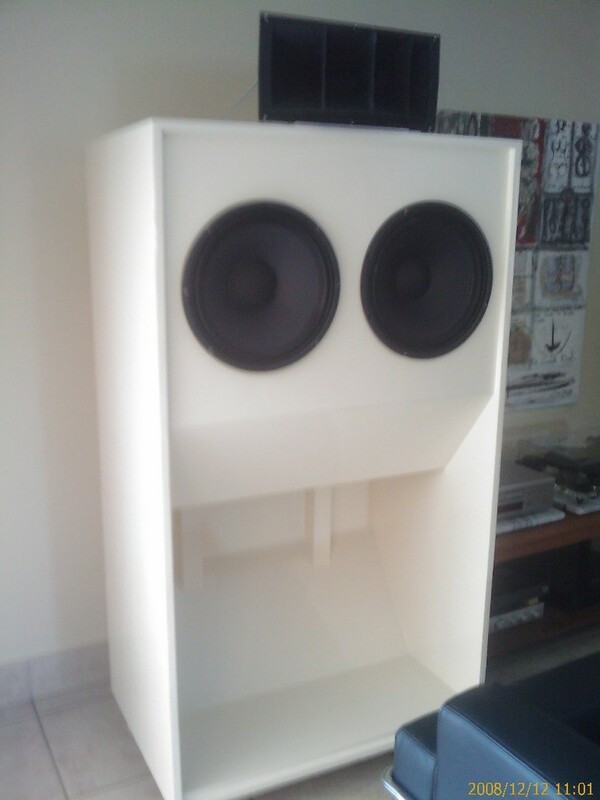 I've built some speakers where the wood was the minor component. If I didn't have a mate in the chipboard factory, well yeah, I'd be looking at maybe 2-3 thousand dollars. As it was, I got all the wood, HD Particle board (18mm) for $100. Building the Decware Imperials has made me change my HIFI attitude totally and the following would never have happened if I had not found the Decware Imperials on a HIFI forum in 2008. In late 2008 I bought a dbx Driverack 260, a Rotel RMB1077 7 channel class D amp and started to drive each speaker element separately. Last year I tested several of the high end active crossovers with price tags up to several thousand dollars when I stumbled upon the Bunker BPD-1. I started to talk with the manufacturer and eventually we initiated a cooperation. This has resulted in a HIFI version with a linear power supply that sounds outstanding. My Imperials are now digging down to 20hz and they produce an improved more transparent high end. I have finally finished the horns under the living room. They are equipped with 4 pcs 18Sound 15W1200. I am presently dividing at 67hz and they work fine. They go very deep. I have now after 5 years replaced my DSP Bunker BPD-1 with a dbx Driverack Venu 360. This new DSP sound good and is a step forward. 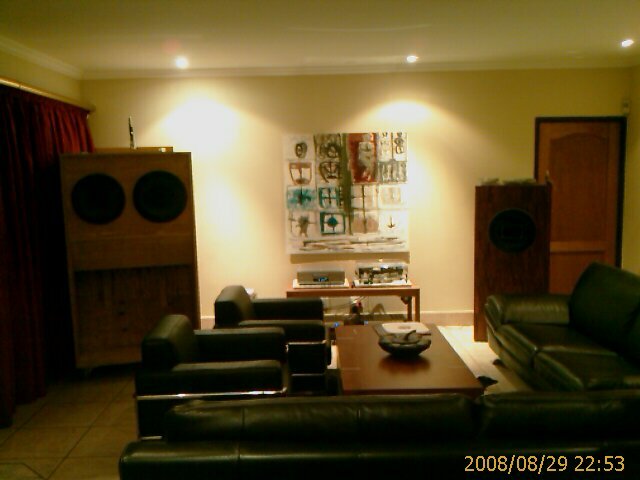 My Decware Imperial speakers are still the best investment in time and money that I have done for my HIFI. They make a nice combo with the Mantaray 94 horns and the old Altec Lansing 288-8G drivers. that looks nice Cobra, how big is the room? Hi, sorry for late reply. The room is 81sqm.